It’s a problem that popped up two years ago but is now raring its angry head. The emerald ash borer is starting to kill more and more trees around Evansville. Two ash trees are outside Willard Library are the latest victims to the tiny green bug but they are likely not the last. Dickerson isn’t sure of a certain number of ash trees that are in Evansville and are susceptible to the emerald ash borer but he estimates in the thousands. Around 6 to 7 percent of all trees in Evansville are ashes. Arborists say this is one of the most sad problems facing their profession. Ash trees are often quite tall and make up a lot of the natural landscape around town. Experts suspect the emerald ash borer came to America in wood pallets shipped from Asia. They are an invasive species and the damage they’ve caused to ash trees across America is hard to fathom. The invasive species lays eggs in the tree and the larvae then eat out the tree from the inside. By the time most folks know they have the borer in their trees it’s too late. The borer leaves no entry holes, just exit holes. There’s not much a person can do when an ash tree is infested. That’s why arborists like Dickerson preach prevention. 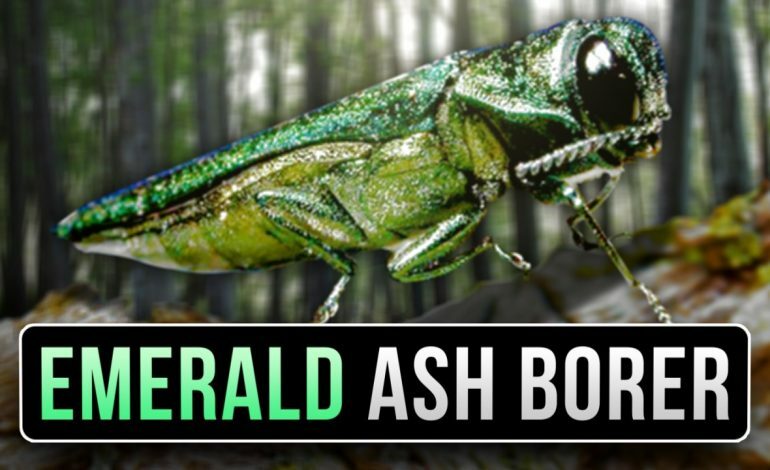 If you want to find out more about the emerald ash borer and how you can treat ash trees to prevent it follow this link to the Evansville City webpage www.evansville.in.gov/urbanforestry. There is also a program to adopt an ash in Evansville. There are upward of 300 trees on public lands that can be adopted and saved. The adopt an ash program saved 95% of ashes when the program started in 2016. Many of those trees that were treated originally now need treatment again. Info on the adopt an ash program can be found by following this link evansville.adoptanash.org.